House Resolution 428, which urges the president to declassify a 28-page finding on foreign government support of the 9/11 hijackers, continues to gain momentum. As the list of H.Res.428 cosponsors grows longer and longer, however, one representative is increasingly conspicuous in her absence: House Minority Leader Nancy Pelosi. 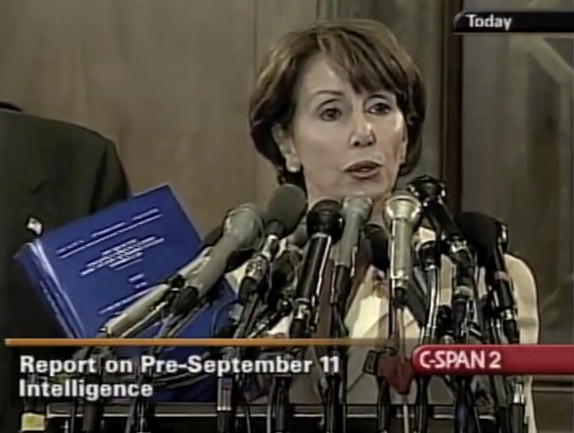 Pelosi was not only the ranking House member of the joint Senate/House intelligence committee inquiry that produced those 28 pages, she was also a vocal critic of the Bush administration’s decision to classify them. “The joint inquiry took nine months to do its work. It took nearly that long, or over six months, to negotiate an unclassified version of the report with the administration. This was about six months too long. Much more of the report could have been declassified without any impact on national security. This is especially true with respect to references to sources of foreign support for hijackers. Her rationale for wanting the 28 pages declassified rings every bit as true today as it did when she offered it 11 years ago. Indeed, one could imagine those same words being attributed to Walter Jones, Stephen Lynch and Thomas Massie, who are leading the resurgent movement to release the 28 pages. And yet, Pelosi has not only fallen silent on the issue, she hasn’t even mustered what little energy is needed to add her name to those of many other Democrats who have signed on as H.Res.428 cosponsors. Why would Pelosi afford President Obama—who reportedly twice promised 9/11 family members that he would release the 28 pages—any more deference on the unwarranted classification of this material than his predecessor?